LastPass vs 1Password – Which One is Right for You? We’ve talked before about the importance of using a password manager in this age of constantly hacked services. There’s no perfect solution yet, but we’ve been able to prove time and time again that letting a human pick passwords is pretty much the most flawed approach you can take. We can’t remember passwords, and we can’t even invent random ones, so we fail from both sides. We cannot be trusted. If you use a password manager, can choose to have it create random passwords your brain would never think of, and which you can never type. We’ve also talked about using Bart’s awesome xkpasswd tool to generate random and yet typable passwords. I’m betting that many of you are in the camp of “yeah, I know I should use a password manager, and I’m really really going to get around to that soon.” Sort of like the old days when we all knew we should be doing backups but it was just too darn hard, so we didn’t start doing them until it got as easy as plugging in a backup drive. Now there’s really no excuse not to use LastPass or 1Password. You may recall that I have been a LastPass user for a few years, but I’ve been frustrated because they were never able to fix the problem I had that it would stop logging me out when I was idle, which was enough to push me to 1Password. Now that I’ve used both for a while I’d like to walk through each one and give you some pros and cons so you can make your own decision. Remember, they’re both GREAT services, and you will not go wrong either way. I remember when Dorothy was trying to decide and she made a big pro/cons chart for herself, and in the end flipped a coin. She ended up choosing 1Password and so did Bart, which might be all you need to help you decide. Customer service slow and unhelpful. Feels like an open source application. Works with TouchID beautifully – both in Safari AND to open your vault – critical when needing to log into apps, like your banking app. This functionality is enough to make me pretty sure I’ll upgrade to the next iPad (from the Air) just to get TouchID capability in 1Password. Very good technical support. Quick response and intelligent people. From what I’ve heard this is standard, not just because they happen to know who I am. The bottom line is that for what’s important for me, 1Password is now the clear winner. The better technical support, better TouchID support, nicer user interface are all worth the money. If money is your primary concern, LastPass is an excellent choice, as long as it logs you out properly when you’re idle. If that stops working for you like it did for me, then I’d cut something else out of my budget so I could afford to run to 1Password. If you’ve been a LastPass user, and my discussion has convinced you to jump ship to 1Password, there’s a really useful script you’re going to need. This script will take the export of your LastPass data and convert the data so that it will slide nicely into your new shiny 1Password vault. If you don’t use this script, you will be missing a LOT of data that you’ll have to replicate. Without it my 125 software license files didn’t come over! I should mention that it was written by a 1Password evangelist, not vetted by AgileBits, but Bart did review the script and said that it does not send your passwords to China OR the NSA. I put a link in the shownotes to the script. I started on 1P and moved to LP during their debacle of the AppStore only upgrades when version 4 was due. I agree with most of what you say and do agree that 1P is probably best for inexperienced users. BUT the one killer feature of LP for me is the 2 factor authentication feature. This allows me to use the extensions on work computers and not worry about anyone else getting into my vault. I and several others repeatedly asked for 2 factor auth on 1P and they said many times that it’s not possible. I have been a happy LP user for 2 years now and hope that it will be beautiful one day! I’ve pretty much decided to go with 1Password, but my confusion now is should I buy it through the Apple Store or through the AgileBits web store. Any advice? Based on a FAQ I found on AgileBits website, it looks if I purchase through their online store, I loose the ability to iCloud Sync. Is this true? I could still sync via DropBox, I just been very happy with all my iCloud syncing and I’m afraid I’m going to regret it later on. Thanks in advance. RC – I ended up buying through the AgileBits website because they had really good family pack pricing. Being able to put apps on all of my devices really makes me happy but their pricing made it work for me. I ended up using Dropbox anyway though. Not sure if there’s a downside to Dropbox syncing? Thanks Allison! That’s probably what I’ll do as well. My wife has an older MacBook that is no longer upgradeable. By the way, love the show! Keep up the great work! Thank you so much for this comparison post; it’s very helpful! It’s also incredibly generous of you to post the conversion utility for anyone to use. I was struggling with my LastPass (don’t get me wrong, I’m still a fan, it just still has some tweaks). But I wanted a tool that’s more consistent across browsers but more importantly an option to not store my data in the cloud. I’m glad I found your site, there’s a TON of info here 🙂 Already loaded you in my feedly. Hope this makes it go even more smoothly for you Melissa. I’m using 1password for a short time now and I’m very happy with it. My killing feature was WLAN sync you get with the Mac or PC version. I’d never put a key file to any cloud. If someone “find” it, it has the value to be cracked. Passwords didn’t change that often, that there is a need for immediate sync compared to the risk to “publish” all your secret data. You make a good point, Volker, it seemed critical to me that I have my passwords synced real time, but you’re right, they don’t change that often. I really wish 1Password had a way to keep shared passwords in sync other than the shared vault concept. With LastPass Steve and I are able to give each other passwords, either can change and it syncs back to the other person, all within the same vault. Other than that I give 51% vote for 1P on everything else! 1Password has another great feature that is not mentioned. You can store images. I have a scan of the passport of all members of my family. A stolen passport is a nightmare but having a photocopy that you can print out from anywhere will help you wake up! I’ve used 1Password for years and am now thinking about getting LastPass following problems syncing, in fact I can no longer sync to my 3GS running iOS6. I am on an old Windows PC 25% of the time, the rest I am on Mac, not enough to justify buying 1Password for Windows + upgrading to Windows 7, so as to use iCloud for Windows. Oh and I got six months of LastPass Premium free so right now I am tempted to switch. Those sure sound like good reasons to switch, Ian. LastPass is a fantastic service and even though the interface isn’t as pretty as 1Password, I bet it will be great for the Windows part of your life and your senior citizen iPhone. Very cool that you can still use it for this. I wonder if there are tools to go from 1P to LP? The databases have much of the same information but if the fields aren’t lined up properly you will just get a mess on the other side. I don’t understand how either one will work if you are not on a device that you own. If I am traveling and use a hotel computer, how do I log into my sites if I don’t remember the password generated by these programs? LastPass supports the YubiKey or other two-factor authentication mechanisms. It has the option to require two factor authentication each time you log in, or only when you log in on a new device. This means that if someone got ahold of your credentials, they still couldn’t login without your two factor authentication device. I use the Yubi Key. LastPass also can prohibit your account being reached from other countries, so hackers someone else can’t login in even if they had your credentials. It can also prevent logins to your account if connecting over Tor. Kathy – I had to check with Bart on this to get the full answer, and you’re not going to like it. If you don’t use a password manager when using an untrusted computer (like in a hotel), all of the passwords you type in can be compromised. If you DO use a password manager like LastPass or 1Password, you STILL can’t safely use them on an untrusted computer. If the computer has a keylogger installed on it for example, all of your keystrokes are registered by that computer, whether they’re native (you typing them directly) or whether you’re revealing them to the computer through 1P/LP. The only safe way to use passwords away from home like that is to use your own laptop or a smart phone. Windows Phone, iPhone, Android – using them over a CELLULAR connection connection (not free hotel wifi unless you also use a VPN) is the only way to be secure. Bart and I are going to use this question on Chit Chat Across the Pond this weekend because I didn’t actually realize this myself. Hope you won’t be offended if we call it a dumb question! Thanks for the great analysis of the two. I have been using 1Password for a month and am so grateful to have made a positive step in securing my world. As most every human being in the digital world, it has to be convenient for me to do it. I was going to try LastPass for a while, but I am pretty convinced by your review to stick with 1Password. UNLESS LastPass has one feature that I would really love: quick login to apps on my Android. This would be a tad more convenient. I would try out LastPass just for this feature. So, my hope would be that after I have logged in to IFTTT on my Mac and created a nice complex password for it, I could log in to the IFTTT app on my android tablet without flipping back and forth between apps. Perhaps I live in a fairy land where everything is possible and convenient and secure, but do you know if this feature exists? Joel – I’m glad this helped you out. I could have sworn I heard people say on a podcast a while back that on Android you can flip down a menu from above that gives you quick access to LastPass to give you your passwords. I’m not promising but it’s definitely worth a look. I have a Mac Maverick..and had 1password..had problems with the computer..got that fixed, but in the process, 1password was dumped..and I can’t retrieve it..NOW WHAT? You can get it back from your backups, Marle. Or if you had the vault in Dropbox it should still be there, right? Hi Podeet. LP has a screen keyboard facility so no risk of key loggers in hotels etc, I wonder if 1P does this as well? I have been using LP very happily for a few years now but just got 1P as part of a bundle so willing to give it a try after your review. I find the 2 factor authetication with Lastpass as a security must-have, since I use it on multiple computers at work. Also, the Lastpass app on iOS is fantastic for quick logins to frequently used websites – just click the website and Lastpass takes you there, fills in the un/pwd and all you have to do is click the login button. Plus, at $12/year, I don’t feel committed to staying if something better comes along the next year! That’s excellent, the_dude! If it would agree to log me out I would have stayed with LastPass for sure. I’m glad it works for you and everyone else. Kinda jealous but at least it’s good we have good options. Does anyone know how Lastpass supports itself? It has to get money somewhere. That seems important in understanding what you are getting with the program. Forgot to ask for an email confirmation if there is a reply. I recently purchased LastPass and love it. I was so tired of entering user IDs and PWs on my iPhone and iPad. I absolutely love that I can use it on my desktop. I think the $12/year is absolutely justified given the flexibility of this app. I’ve been using LastPass for about one year now, never try 1Password. So far, LastPass fill my needs, it’s simple and free for desktop device. Hi, great comparison piece. Thanks for all the hard work on it. Been a LP user for a couple of years and agree with your pros and cons. Considering moving to 1P. I do leverage the secure sharing feature of LP though and it wasn’t clear if 1P had a similar feature? Essentially allowing a trusted individual to login to an account with your credentials without being able to see them and having them sync if you change them. Any insight on 1P and whether it does something similar would be appreciated. I’m a 1Password fan. I don’t consider it expensive in terms of the value and the security that it represents. I mean honestly, it costs the same as a few movie and burger nights,or a few weeks worth of Starbucks. I have no issues paying a premium for a product that delivers. I use Dropbox as my sycning tool. I’m not worried about someone gaining access, because I use 2-step authentication on Dropbox. Assuming they are able to break in through that, they would still need to crack my 1Password password as well. And if that file is vulnerable on Dropbox, so is everything else we store on there. I don’t see the need for 1Password to offer 2-step authorization because the program itself doesn’t store its data in the cloud to begin with. Having said all of this, I’m the kind of guy who likes to play around with different software — try new things. I’m testing out LastPass now. Some stuff I like. Some I don’t. Glad you found value in this, JohnC. 1P doesn’t do password sharing as easily as LP. On LP Steve can share a single password with me. On 1P you have to create separate vault that you both access. This means when you create the pw you have to anticipate that you’ll want to share it. If this is an important feature for you (and LP is auto-logging you off) then I would stay with LP. I have used 1Password for a while now, but I have recently switched to LastPass. One of the main reasons for the switch is that LastPass will work on my wife’s Chromebook. There are two other annoying issues with 1Password. Firstly, syncing is limited to iCloud and Dropbox. iCloud is not an option with non Apple devices and as a Google Drive user I am not prepared to pay Dropbox prices. Secondly, if a site does not have 1Password then it will continue to pop up in the middle of the screen on every visit to the site with no option to never remind me again. LastPass shows a little blue bar at the top with the option to never remind again. Initially, LastPass did not seem as intuitive as 1Password, but once you get the hang of it, it is easy. And there are some power user features. 10. Truly multi-platform. 1Password is now supporting more but is still quite Mac centric. The only issue I have with LastPass so far is the interface looks like a throwback to the 90s. Great points, David. I REALLY wish I could still use LastPass but I’m glad there’s a (good) alternative that works for an Apple-centric house at least. podfeet, are you using the AdBlock plugin/add-on in your browsers? I found that it conflicts with the lastpass plugins and prevents the application from the idle log out. I’ve even found forum posts for AdBlock and LastPass with others having the same issues. IF you do use AdBlock try turning it off, restarting and then test your idle log out… not idle because I love AdBlock, but that was my problem. Interesting Shane, hadn’t thought about ad blocking. I’m not actually running adblock but I wonder if another plugin or browser setting is keeping LastPass from functioning properly? I will give this some thought, thanks! I originally used RoboForm years ago and then migrated to LastPass. I’ve had LastPass for several years now and simply love it. I have tried 1Password but I’m definitely not a fan of it. LastPass is great because it’s multi-platform and can be accessed virtually anywhere! I’ve looked around at alternatives but always come back to LastPass. You don’t have to shell out the $12 unless you want to use the mobile app to access your passwords, etc. You can always login via your devices web browser and use it that way….it’s just not as user friendly. Great testimonial Steven. I loved LastPass till it stopped logging me out but I’m sure glad it works so well for everyone else! Thanks for weighing in. I think the $12 is totally worth it to get the fingerprint ID on iOS, no more typing in your pesky long password! If, like me, you have a huge list of “Never for this Domain” URL’s, and you want to clear them out, you cannot do so except ONE AT A TIME. And each one must be deleted in their interface (which is, frankly, crap) as well as confirmed. With a list of several thousand, which impacts performance, this becomes impossible. I reported this to LP mid-2014. No fix. They claim it’s a “feature request” that is being “considered”. To be fair, if you rarely, or never, use the “Never for this Domain” feature, this won’t affect you. Does either application have a script that will import encrypted passwords from Blackberry’s Password Manager? 1Password imports from CSV, SplashID vID and other formats. Here’s a link to how it works on 1P’s Mac-specific page: https://guides.agilebits.com/1password-mac/4/en/topic/importing-data There’s also Windows info there too if you need that. That said, I think you’ll have to export an UNencrypted version of the passwords first. If you’re on a Mac, I’d suggest using Disk Utility to create an encrypted disk image and export your password vault into the disk image. That way you can open it just long enough for LastPass to import the file but then encrypt the image to keep it safe while you test. 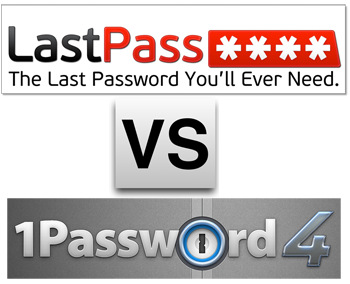 Appreciate the discussion of LastPass vs. 1Password. I have been using the password vault feature in Norton but am unhappy with the way Norton sometimes likes to take over my computer. Does one family license take care of our three windows computers and two I-Phones. Can each family member have their own password? Would love to help you out, John but you didn’t specify which tool you’re asking about. In any case you’d probably get a better answer if you checked with the software vendor directly. I wanted to know if 1Password is still charging more money for major upgrades in Desktop apps ? And is Premium option an onetime purchase or not ? Hey Ali – yes 1Password is often a paid upgrade for major upgrades. I was surprised though that they were pretty generous on the pricing. I bought a single user license through a bundle, and when I went to upgrade to the latest version, I wanted a family pack and they only charged me $25. I know your mileage may vary but I doubt it would be worse than that to do a regular upgrade. When you say Premium I’m thinking you mean in LastPass, and if so that is a yearly fee, not one time only. Overall I think LP is less expensive but I have gotten better service on 1P. Luckily they’re both GREAT choices, so something for everyone. Lastpass stores your passwords and ID on their servers. 1Password does not. Yes, Lastpass encrypts your data, but at the end of the day, the data is still at risk. For me, that’s the determining factor. 1Password is not dirt cheap, but it’s not overpriced. Always remember – you get what you pay for. You’re exactly right Adam, if you choose to keep your vault ONLY locally. If you choose that option you are making a tradeoff; you can’t get to your vault from your mobile devices (iPhone, etc). Most people put their 1Password vaults either in iCloud or Dropbox so you’ve got the same (very low probability) problem. Remember that even if LastPass (or Dropbox or iCloud) got hacked and your vault was in the released info, they would STILL have to crack the password with which you’re encrypting the vault. LastPass does NOT have that password and neither does 1Password. A few years back there was a breach at LastPass…and no one lost a thing because the hackers couldn’t crack the individual’s vaults. That does assume you’re smart enough to use a wicked long/complex password to protect your vault! Thank you very much for your reply Allison, it is great when someone is there giving fair advice. Actually I do have a LastPass premium service and I am really happy with it but it really bothers me when I see that my passwords are stored on their servers. I have a web hosting company and I have my own cloud service (using OWNCLOUD) and actually I was searching to see if 1Password supports storing passwords on an own cloud account (like dropbox) for syncing purposes that I came up with your website. I would definitely switch to 1Password if they start supporting OwnCloud . LastPass is a seamless, easy, intuitive setup. Get a small-footprint extension for a desktop browser, an app for your phone. Make a name and password. The end. Go to any other platform and sign in with your name and password. Boom. Your vault is accessible on desktops and mobiles. 1Password has you make a password but no name?! You need to download an .exe to run 1Password on desktop. If you go to a mobile platform to access your 1Password vault, you will need to upload your vault into another cloud!? Hope you feel safe with DropBox. In contrast with LastPass’s seamlessness, 1Password will give you links to 3rd party scripts to transfer your vault. Feel safe? If your job and hobby aren’t editing code, you’ll love crawling through forums with contradictory info and dealing with obscure extensions that you’ll have to search the internet just to open. You see, a .txt would be too accessible. x – You make some good points. I see the advantages on both sides though. You say “you will need to upload your vault into another cloud” and “hope you feel safe with Dropbox”. With 1Password you have a choice of who to trust AND whether to trust at all, with LastPass you HAVE to trust the cloud and you only get to trust them. I do trust them, but some people don’t want to trust anyone. If so, you can keep 1Password local to your machine and share the vault over wifi to your devices. Again, LastPass users must trust the cloud. I agree about 1Password telling you to use the script written by 3rd parties – I gave them a LOT of thoughts on that. They should either vet the software and declare it good or they shouldn’t recommend it. They straddle that and say use it but we don’t endorse. Bad practice in my opinion. After another year of using 1Password I find the interface make me happier but if they went away tomorrow I’m delighted that LastPass is there, and that we have two awesome choices. I use “Intuitive Password” online password manager. It’s a web-based password manager and your data is securely stored in the datacenter. With Intuitive Password, you can easily access your data at any time, any where. It works on all devices without installation. Looks interesting, Josh. I don’t know exactly how to tell whether the new players in this area are secure or not. 1Password and LastPass have been vetted by experts over the years. Not saying there’s anything wrong with Intuitive Password, they say all the right things, just don’t know how to tell if it’s the real deal. Your review said Lastpass stores your passwords locally and on their servers, while 1Password requires you to sync your devices using iCloud or Dropbox. I used Lastpass initially but switched to 1Password because I wanted to keep all of our passwords locally on our own devices. During my free trial period with 1Password I found I can keep our vault (they call it a keychain file ) in a folder on our home wifi network, which is accessible to every Mac and Windows computer in our house (3 Macs and 2 Windows). I do this using a USB drive plugged into our Time Capsule, but I’m sure it can also be done with a NAS or any other network drive that can be accessed by all computers on a user’s home wifi network. During setup on each computer 1Password asks where to look for the keychain file (they call it a Sync location). You can choose iCloud, Dropbox, or a local folder. I chose “local folder” and pointed 1Password on each of our Mac and Windows computers to the same folder on our Time Capsule USB drive. It works perfectly and 1Password even mounts the network drive if it is not already mounted when I sign in to 1Password on a particular Mac or Windows computer. I also have the 1Password app on our iPad and iPhones. They Sync directly from any of our computers over our wifi network. Our laptop computers, iPhones and iPad work fine with 1Password when we take them away from home. If we add any new login items (new passwords) when we are away from home the new items are added automatically to the Sync folder on our network drive the next time we Sync at home. I’m so glad you wrote in, Joe. I only found out about the wifi sync capability recently and I did not know that you could change things on mobile and they’d sync up when you got back home. That’s an awesome solution. I’m not sure I entirely follow your questions but let me walk through what we were trying to explain. Unlike a shared wifi network, if you’re on a cellular connection, there’s no need to use a VPN. If you’re on a VPN on a shared wifi network (or on a cellular connection) it’s safe to enter your passwords on a computer or smart phone. I believe we said that if you’re using a shared computer, do NOT enter any passwords. Whether you go onto a VPN or not, the computer itself has a much higher chance of having been compromised in some way, specifically having a key logger installed (an application or device that captures the keys you hit, thereby saving your passwords and sending them off to some evil character. Does that make sense Dario? LastPass app uses touch id too. My 1Password trial just ended, so time to decide. I don’t have everything in 1Password yet. Your review helped. thanks for telling me, Paul, that’s nice to hear. It’s been about a year for me on 1Password now and I am very happy with it. Converted many family members over too! Don’t both of these apps offer free versions? That was what I was considering. What would be the reason(s) to pay if they offer free version? Barbara – I think there’s a free version for iOS of 1Password but not for the Mac or Windows. I think the primary usefulness is diminished if you don’t have them everywhere. I think there is a free version of LastPass though but I wanted all of the features. You would have to trade off for yourself the features that you get if you pay vs. your wallet size. So with the free version, I would just be able to use it on my iPhone and iPad, but not my MacBook or iMac, right? It might be a good start as a trial?? FYI – some of the info about LastPass is slightly out of date. For example, LastPass on iOS has Touch ID enabled and it works great. But overall nice comparison! I do have to say that LastPass looks kinda ugly when compared next to 1Password, but the reason I am sticking with LastPass is because they cater to the crowd that works in teams a little better and their “enterprise” offering is REALLY great for sharing passwords with team members, and that is the most important at the moment for me. 1) LastPass would only save two-field logins (e.g. username & password), whereas 1Password is able to save more than two fields of login information (especially useful for bank account logins). 2) 1Password has a very nifty hot-key that automatically autofills and submits your login information (Cmd+\ on a Mac, Ctrl+\ on a PC). This is very useful when sharing your computer with someone else, since the Autofill option offered by LastPass basically takes over your login and ‘forces’ you to use the stored credentials. Plus, the 1Password GUI is way prettier. Timely discussion. Longtime paying customer of LastPass, and concerned about LastPass being purchased by “LogMeIn”. The latter has a bad rep. and has a lot of folks concerned. Good comparison and informative comments. I tried both and then forced to stick with lastpass since it works on Linux(chrome extension) and 1Password does not have that capability, correct me if I’m wrong. I love to use the local storage only option of 1Password if there’s a Linux workaround. Can you make a paper copy of your 1Password info? Here’s why I ask. Being a very bohemian kind of girl, I have used LastPass for years. The other day I was prompted to change my master password which had not been changed in a while. So I did and a message came up, “server connection lost” but I got a confirmation email that I successfully changed my master password. However, when I went to type in my new password I couldn’t get in. Fortunately, I made a paper copy of my files which I store with my digital assets and wishes folder in the safe deposit box at the bank as well as in the cloud. People, you are gonna die so you better leave this stuff somewhere for people to get to your stuff. So for the inconvenience factor alone, I want to kiss LastPass goodbye. I will cough up the money for password protection but want to know about the printing feature. Anyone? Yes, Jane, you can print it out. You can export a selected item or all items to a .1pif format ( 1Password’s proprietary format) or you can export to a csv (comma delimited format for pulling into Excel) or you can do it as a plain text file. You could then open the file (I’d probably import into excel so it would be a table you’d have a chance of reading) and then print it out and put it in a safe deposit box. This only works until you change a password and then it’s out of date, AND at one point in time you will have the files in an unencrypted form on your desktop, so be sure to export to an encrypted disk image that you later blow away when you’re done printing! My process is to have my 1Password in my husband’s vault and vice versa. That way someone knows the password (and understands what to do with it). Great suggestions. I do understand that Hard copy data is useless as we update our passwords, add accounts, etc. so frequently so I will implement your 1Password vault process where you “secret” away your password in the other persons vault. Good stuff! if you decide to stop using LastPass or 1password how do you get all of your passwords? Huck – both apps make it super easy to export them as a plain text file. Make sure if you do that to save it into an encrypted disk image, otherwise you’ve just placed the keys to the kingdom right on your drive! I am a LastPass user and tried to use it on the iPad and it doesn’t pop up for a password like Android. Am I missing some configuration on iOS to allow the LastPass to pop up while I am trying to login via iOS? Alliswell – I haven’t used LastPass on iOS but I assume it works like 1Password. When you’re on a web page in Safari, there’s a row of icons across the bottom. One is a box with an up arrow in it. Tap that icon and then there’ll be two rows of options. The bottom row should show things like Add Bookmark, Add to Reading List, etc. Swipe over till you see an icon that has 3 dots and the word More. From there you can add LastPass to that list of options. Once you get it added, press and hold and you’ll be able to move it to the beginning of the list. From now on, you go to a web page, tap the square/arrow icon and then tap on LastPass. Some standalone apps will give you an option to use your password manager but most do not, so you have to separately launch LastPass to get your credentials.